31 December 2007: A Happy New Year! 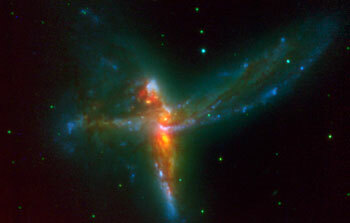 21 December 2007: Using ESO's Very Large Telescope, an international team of astronomers  has discovered a stunning rare case of a triple merger of galaxies. This system, which astronomers have dubbed 'The Bird' - albeit it also bears resemblance with a cosmic Tinker Bell - is composed of two massive spiral galaxies and a third irregular galaxy. 20 December 2007: Yesterday, the 62nd General Assembly of the United Nations proclaimed 2009 the International Year of Astronomy, with the aim of increasing awareness among the public of the importance of astronomical sciences and of promoting widespread access to new knowledge and experiences of astronomical observation. 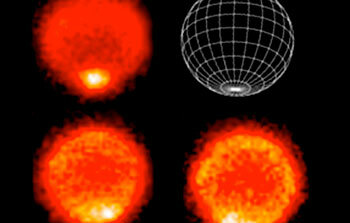 19 December 2007: Using observations from ESO's VLT, astronomers were able for the first time to reconstruct the site of a flare on a solar-like star located 150 light years away. The study of this young star, nicknamed 'Speedy Mic' because of its fast rotation, will help scientists better understand the youth of our Sun. 28 November 2007: Staring for the equivalent of every night for two weeks at the same little patch of sky with ESO's Very Large Telescope, an international team of astronomers has found the extremely faint light from teenage galaxies billions of light years away. These galaxies, which the research team believes are the building blocks of normal galaxies like our Milky Way, had eluded detection for three decades, despite intensive searches. 23 November 2007: On November 14 at 12:41 local time, a major earthquake with magnitude 7.7 on the Richter scale affected the north of Chile. 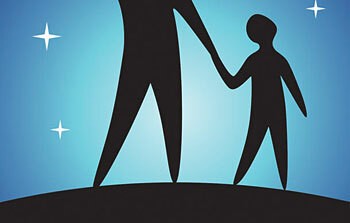 The epicentre was located 35 km from the city of Tocopilla and 170 km of Antofagasta. 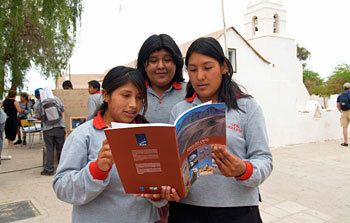 22 November 2007: Today, a new ALMA outreach and educational book was publicly presented to city officials of San Pedro de Atacama in Chile, as part of the celebrations of the anniversary of the Andean village. 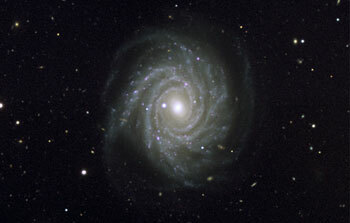 9 November 2007: During his visit to ESO's Very Large Telescope at Paranal, the European Commissioner for Science and Research, Janez Potočnik, participated in an observing sequence and took images of a beautiful spiral galaxy. 27 October 2007: As part of his first official trip to Brazil and Chile, the European Science and Research Commissioner, Janez Potočnik, visited Europe's flagship for ground-based astronomy, the ESO Paranal Observatory. 11 October 2007: Noted for its bizarre hydrocarbon lakes and frozen methane clouds, Saturn's largest moon, Titan, also appears to have widespread drizzles of methane, according to a team of astronomers at the University of California, Berkeley. 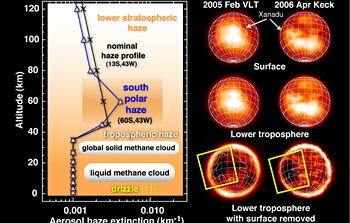 New near-infrared images from ESO's Very Large Telescope (VLT) in Chile and the W. M. Keck Observatory in Hawaii show for the first time a nearly global cloud cover at high elevations and, dreary as it may seem, a widespread and persistent morning drizzle of methane over the western foothills of Titan's major continent, Xanadu. 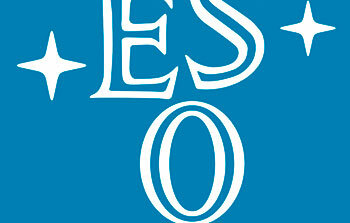 5 October 2007: ESO and the European Association for Astronomy Education have just launched the 2008 edition of 'Catch a Star', their international astronomy competition for school students. Now in its sixth year, the competition offers students the chance to win a once-in-a-lifetime trip to ESO's flagship observatory in Chile, as well as many other prizes. 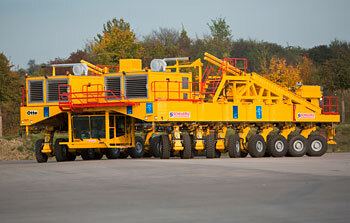 5 October 2007: Today, the first of the two ALMA antenna transporters was given its name at a ceremony on the compounds of the manufacturer, the heavy-vehicle specialist Scheuerle Fahrzeugfabrik GmbH, in Baden-Württemberg. The colossus, 10 metres wide, 20 metres long and 6 metres high, will be shipped to Chile by the end of the month. The second one will follow in a few weeks. 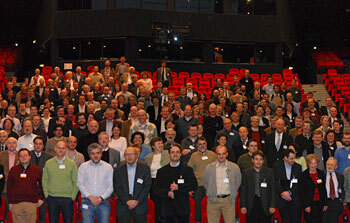 28 September 2007: Today, and for the first time, astronomers share their global Science Vision for European Astronomy in the next two decades. This two-year long effort by the ASTRONET network of funding agencies, sponsored by the European Commission and coordinated by INSU-CNRS, underscores Europe's ascension to world leadership in astronomy and its will to maintain that position. It will be followed in just over a year by a prioritised roadmap for the observational facilities needed to implement the Vision. Implementation of these plans will ensure that Europe fully contributes to Mankind's ever deeper understanding of the wonders of our Universe. 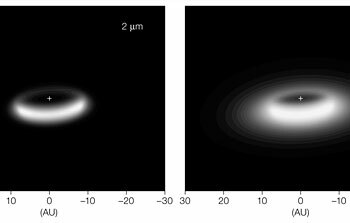 27 September 2007: A team of European astronomers has used ESO's Very Large Telescope Interferometer and its razor-sharp eyes to discover a reservoir of dust trapped in a disc that surrounds an elderly star. 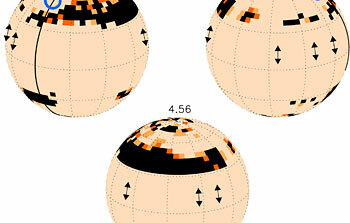 The discovery provides additional clues about the shaping of planetary nebulae. 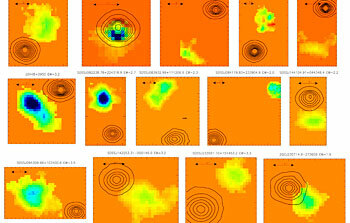 27 September 2007: Using ESO's Very Large Telescope Interferometer and its unique ability to see small details, astronomers have uncovered a flat, nearly edge-on disc of silicates in the heart of the magnificent Ant Nebula. 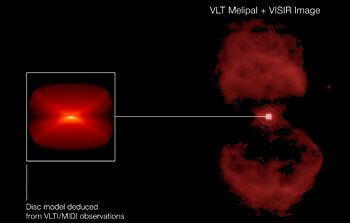 The disc seems, however, too 'skinny' to explain how the nebula got its intriguing ant-like shape. A Warm South Pole? Yes, on Neptune! 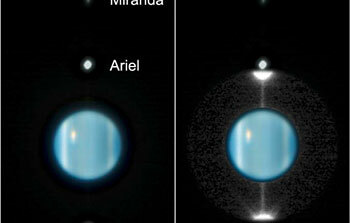 18 September 2007: An international team of astronomers using ESO's Very Large Telescope has discovered that the south pole of Neptune is much hotter than the rest of the planet. This is consistent with the fact that it is late southern summer and this region has been in sunlight for about 40 years. 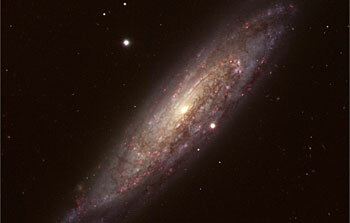 14 September 2007: Astronomers using ESO's Very Large Telescope have discovered in a single pass about a dozen otherwise invisible galaxies halfway across the Universe. The discovery, based on a technique that exploits a first-class instrument, represents a major breakthrough in the field of galaxy 'hunting'. 3 September 2007: Stars do not like to be alone. Indeed, most stars are members of a binary system, in which two stars circle around each other in an apparently never-ending cosmic ballet. But sometimes, things can go wrong. When the dancing stars are too close to each other, one of them can start devouring its partner. If the vampire star is a white dwarf – a burned-out star that was once like our Sun – this greed can lead to a cosmic catastrophe: the white dwarf explodes as a Type Ia supernova. 3 September 2007: On 1 September, Tim de Zeeuw became the new ESO Director General, succeeding Catherine Cesarsky. In his first day in office, he kindly agreed to answer a few questions. 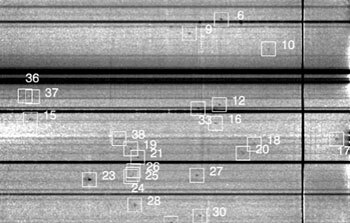 23 August 2007: As Uranus coasts through a brief window of time when its rings are edge-on to Earth - a view of the planet we get only once every 42 years - astronomers peering at the rings with ESO's Very Large Telescope and other space or ground-based telescopes are getting an unprecedented view of the fine dust in the system, free from the glare of the bright rocky rings. They may even find a new moon or two.